The Roker Comp and Redux 3 were featured in Bike World News’ “2015 Holiday Gift Guide.” Whether you are looking for an all-road bike that’ll take you on gravel and beyond, or a rugged urban commuter, Raleigh has two great options. The Roker Comp is the pinnacle of Raleigh’s commitment to all-road riding. Made for riders that won’t let the weather stop them, the Roker features custom geometry for gravel roads and an 11-speed, carbon frame. 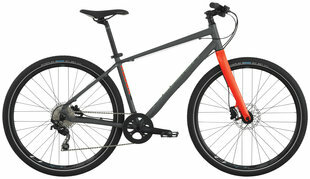 The Redux 3 (pictured above) is a great option for urban commuters. Designed with urban geometry, wide street tires, and a 1x10 drivetrain, the Redux 3 can handle any obstacle the city streets throw your way. Editor's Quote: "...the pinnacle of Raleigh’s commitment to all-road riding."